Fisk was known by the nickname "Pudge" due to his 6'2", 220 lb frame. At the time of his retirement in 1993, he held the record for most home runs all-time by a catcher with 351 (since passed by Mike Piazza). Fisk held the record for most games played at the position of catcher (2,226) until June 17, 2009 when he was surpassed by another "Pudge," Iván Rodríguez. Fisk still holds the American League record for most years served behind the plate (24). Fisk was voted to the All-Star team 11 times and won 3 Silver Slugger Awards which is awarded annually to the best offensive player at each position. Fisk was known as a fierce competitor, a superb handler of pitchers and a natural on-field leader. He was elected to the Hall of Fame in 2000. Beginning in 1962, when Calvin and Carlton first played Charlestown High School sports together, and continuing through 1972, when June graduated from the newly-regionalized Fall Mountain School District, the Fisks could be counted on to appear in postseason playoffs. Along with Calvin, Conrad, and younger brother Cedric, Carlton formed the nucleus of a dominant Charlestown presence in basketball, baseball, and soccer. Early on, though, Pudge's greatest accomplishments came on the hardwood. "Fisk could have made it in basketball," said Coach Silva. "He was that tough." After developing his hoop talent in his grandfather's barn, Carlton went on to some legendary high school performances. In a 1963 regional playoff game at the Boston Garden, for example, he made such an impression in a victory over Winooski, Vermont, that Walter Brown, owner of the Celtics, leaned over to a local reporter and said, "You have got to tell me-who is that kid?" In 1965, , playing against Hopkinton in the New Hampshire Class M semifinals, the 6'2" Fisk scored forty-two points and yanked down 39 rebounds-even though the opposition included players who were 6'10", 6'8", and 6'3". When he fouled out with a minute left, Fisk received a standing ovation from the Portsmouth crowd. Charlestown lost by two points. He was named Charlestown High's most valuable player in soccer and basketball as well), Carlton accepted a basketball scholarship to the University of New Hampshire. During the winter of 1965-66, Carlton led the UNH freshman basketball team to an undefeated season. While at UNH he also met his future wife, Linda Foust, a native of Manchester, New Hampshire. Then, in January 1967, the Boston Red Sox drafted him in the first round. Fisk was at first suspicious, suspecting that he was the token New Englander the Red Sox had taken to pacify local fans. He ended up signing mainly because he realized "I could never be a six-foot-two power forward and play for the Celtics." Drafted by the Boston Red Sox in 1967 as the fourth overall pick of the draft, Fisk got the call to the big leagues for two games in 1969. After some seasoning in the Boston minor league system and serving out a military commitment, Fisk was back with the Red Sox in 1971, appearing in fourteen games. That year in Triple-A ball became one year with Double-A Pawtucket in 1970 and another with Triple-A Louisville in 1971, but Fisk remained upbeat and continued to improve. At Louisville his manager was Darrell Johnson, whom he credited for making him a major leaguer. "Johnson taught me to think about all the important facets of the catcher's role, the things that help pitchers in various ways and those that let your teammates know you want to win," he told an interviewer in 1973. Johnson also helped Fisk improve his hitting. "When I put the equipment on, my job is defense: to get the other team out, help the pitchers get the batters, help the fielders-to run the game," Fisk said. "Once I take the equipment off, however, I stop thinking defense and start thinking offense." After some seasoning in the Boston minor league system and serving out a military commitment, Fisk was back with the Red Sox in 1971, appearing in fourteen games. Pudge broke out for the Red Sox in his first full season in 1972. Fisk hit .293 with 22 home runs. From the start, Carlton was a slugger. By June 13 the 24-year-old rookie had collected 32 hits, 20 for extra bases. His average was .278 and his slugging percentage was .574. His confidence rose with his slugging average, which stood at .628 by July 12. He was beginning to attract attention. 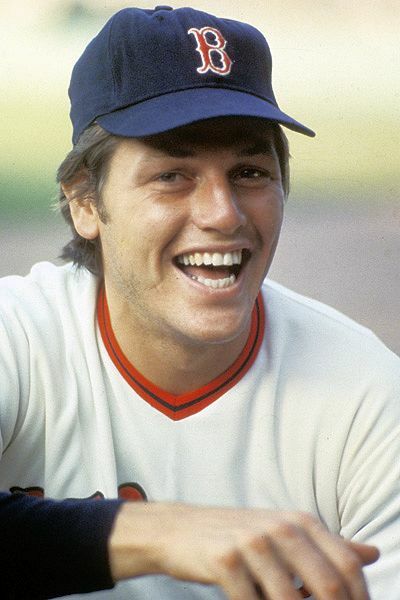 "Fisk is rapidly gaining the reputation of being the Johnny Bench of the American League," wrote Larry Claflin. In July, Earl Weaver selected him to represent the A.L. in the All-Star Game in Atlanta. Fisk replaced Bill Freehan in the sixth inning and suddenly found himself playing against Hank Aaron and Willie Mays, whose bubble-gum cards he'd collected back in Charlestown. As the result of his 1972 season, Fisk won both the AL Gold Glove at Catcher and the AL Rookie of the Year awards. The Red Sox had been searching for a quality receiver ever since the Birdie Tebbetts/Sammy White era of 1947-59. In Fisk they finally had a tough, productive, intelligent, and dependable backstop. "If you play against him you hate him," said manager Eddie Kasko, "but if you play with him and want to win, you love him. He plays as if he were on the Crusades." In June 1974, Fisk suffered a devastating knee injury when Cleveland Indians Leron Lee collided with him at home plate, tearing several knee ligaments. After undergoing reconstructive knee surgery, Fisk was told he would never play again, yet the backstop returned just twelve months later to hit .331 in 1975 to lead the Red Sox to the A.L. East title. Fisk batted .417 against the Oakland A's in the League Championship Series, but his greatest heroics were yet to come. A well-known moment of Fisk's career came in the 12th inning of Game 6 of the 1975 World Series at Fenway Park. He hit Cincinnati Reds pitcher Pat Darcy's second pitch down the left field line that appeared to be heading into foul territory. The enduring image of Fisk jumping and waving the ball fair as he made his way to first base is considered by many to be one of baseball's greatest moments. The ball struck the foul pole, giving the Red Sox a 7–6 win and forcing a seventh and deciding game of the fall classic. The image of him waving the ball fair changed the way baseball was televised. Fisk was among the top offensive catchers in the American League in his eight full seasons with the Boston Red Sox. Over that time, he averaged 20 home runs and 70 RBIs per season. His best year in Boston was in 1977 when Pudge hit .315 with 26 HRs and 102 RBI. Fisk was reportedly among a group of several Red Sox players who lobbied Boston management for players to be paid what they deserved, which made him none too popular with Haywood Sullivan, the Boston general manager. Fisk was named to the A.L. All-Star Team seven times during his tenure in Boston. During one pennant race when his team was battling the Red Sox, Baltimore Orioles manager Earl Weaver said, "The guy they'd hate to lose most, even more than Rice, is Fisk." In determining Fisk's importance, consider that in 1980 the Sox were 68-44 when he was behind the plate, 15-33 when he was not. Yet by 1981 Fisk was questioning whether the Red Sox front office really wanted him. Contract negotiations proceeded slowly, and then general manager Haywood Sullivan blundered by failing to mail his contract on time, rendering Fisk a free agent. As a result, Fisk was technically a free agent and he signed a $3.5 million deal with the Chicago White Sox, beginning with the 1981 season.